Mt Cho Oyu recognized as the world’s sixth tallest mountain is believed to be a sacred peak to the locals. It is located high over the Tibetan plain lands on the Nepal and Tibet border. It is a best choice for mountain climbing enthusiast having height of 8012m. The first climber of Mt. Cho Oyu was S. Moechler, P. Dawa Lama and H. Tichy in 1954. And till today the peak has been climbed by a lot of mountaineers. Mt. Cho Oyu is most probably climbed from Tibet side because of the effortless technique of climbing way. The base camp is at Rombuk glacier lying at 5200m. Then we will depart for the real climb that starts at camp 1 at an altitude of 6400m. Likewise, camp 2 is put up on the edge of a big raised ground at 7125m. 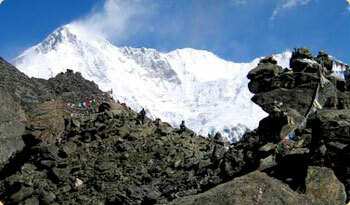 Then we will walk further and then establish a Camp 3 at the ridge located at an altitude of 7550m. After that from here, we will have two rocky steps, so we will fix another set of ropes before moving to the summit. We will actually have a long tow to the summit upland. Once we are on top, the scene is views are magnificent views including Everest (8848m), Nuptse (7855m), Lhotse (8501m), Chamlang (7319m), Ama Dablam (6856m) and other many peaks of the Khumbu area to the east as well as south. To the west, we will see the Melungtse and Gauri Sankar massifs. Without doubt, Mt. Cho Oyu Expedition is intended to everyone from proficient climber to an inexpert but adventure enthusiast as anyone will be guided by an expert mountain guide. Spring and autumn are the best time of year to go for Cho Oyu Expedition.